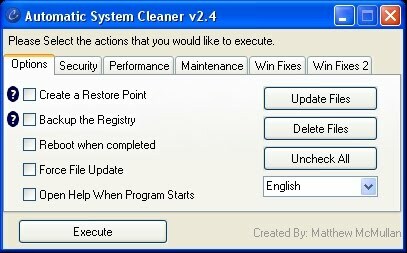 Automatic System Cleaner is a freeware tool for fixing computers. Its primary objective is to remove most of the work from software repair of computers. It functions both as an automatic runner for other freeware utilities, and as an independent repair tool. Most of the tasks completed by the Automatic System Cleaner are things that are commonly needed on home computers. The simplicity of its "Check and Run" interface makes it simple and effective for the average home user, as well as a powerful tool for professional repairmen.